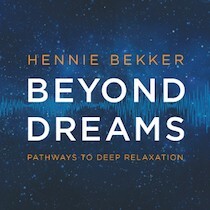 Hennie Bekker has a new release titled Beyond Dreams. As explained in the most clear and concise fashion on his website…it combines rhythmic entrainment with melodies that listeners can enjoy while preparing for sleep, meditating, or practicing yoga or general self-exploration. The album contains six tracks comprising sixty minutes of continuous music that is designed to help the listener achieve a deep state of relaxation. Here is a definition of entrainment: Entrainment in the biomusicological sense refers to the synchronization of organisms (only humans as a whole, with some particular instances of a particular animal) to an external perceived rhythm, such as human music and dance such as foot tapping.. This is not a typical review that I would present. More importantly the music itself is the main tool to reach a level of consciousness that simply cannot be attained in normal daily circumstances. I think to single out any one particular track would not make sense in this case. The six tracks offered, seamlessly flow into another in effect taking six tracks and making it one. I took in this experience a little at a time then all at once. The influences can be significant dependent on your approach. Just taking in a track or two is relaxing however if you are looking for sustained focus the best way to enjoy this CD is to get into a comfortable quiet area and put the headphones on and some blinders and then take it all in. I found it to be a beautiful and relaxing experience having the aid of the music to remove me from the stresses and thoughts that were going on inside and around me (in a peripheral sense). The high point of stress and worry in my life found this experience to be timed just perfectly to use the tools before me. Brainwave Entrainment is the main objective of this music. We need to change the frequencies we are hearing to reset our thought patterns hence changing your overall attitude. It does work and I think what Hennie Bekker has presented here is a gift of music and an opportunity for healing and renewal. There is a lot of music I hear that serves this purpose but the difference here is the scientific aspect and the thought and care that went into how exactly this music will affect you. This is definitely Beyond Dreams, it is reality, a reality that can change with a little help from Mr. Bekker. Even if you end up falling asleep while meditating there is a positive effect on your body, mind and spirit. The subliminal touches take over once you reach that plane of existence. Any way you look at it this is music that is helpful if you want to take the time to hear it and let your consciousness absorb it and process it. Beyond Dreams is music that is multipurpose. If you just want to hear some good relaxing music it will serve the purpose, if you are looking for more, the options are there at your disposal.